On Friday evening, The Forge hosted the Food Network’s party of 90 of its top executives and celebrity chefs, including Alex Guarnaschelli, Debi Mazar, Jeff Mauro and Gabriele Corcos. The group had a beautiful start to their evening with an hour of cocktails and hors d’oeuvres on the outdoor terrace before moving inside to enjoy dinner. Check back for full coverage of the South Beach Wine and Food Festival 2013 next week. After Mel Gibson was spotted flirting with women on Wednesday night, he was out partying again Thursday in Miami. Our spies spotted the Lethal Weapon star at the W South Beach Hotel’s club WALL, hanging with NFL star Reggie Bush and celebrity chef Curtis Stone. Earlier Thursday night, Stone hosted the South Beach Wine and Food Festival’s Q After Dark, and, like Gibson, the Aussie seemed to be a hit with the women of Miami. On Saturday, February 16, the gathering of the eight best polo players in the world signaled the return of the Outback 40-Goal Game Challenge at the International Polo Club Palm Beach. Grey Goose sponsored the match that benefits the Polo Players Support Group, which provides aid to seriously injured polo players and grooms. Players, including Adolfo Cambiaso, Pablo MacDonough, Guillermo “Sapo” Caset, Juan Martin Nero, Facundo Pieres, Gonzalito Pieres, David “Pelon” Stirling, and Miguel Novillo Astrada, competed for the Grey Goose Longshot Award which was earned by Pieres for his 90-yard forehand early in the fourth chukker. Ferllen Winery, the premiere wine brand from Mendoza, Argentina, joined forces with the Amigos Near Foundation to launch the Ferllen Winery Special Edition Art Series 2013 during a fundraiser gala on Saturday, Feb. 16, at the Paramount Bay. Over three hundred guests, including notables such as restaurateur and wine maker Alejandro Ferllen of Novecento and Segafredo, popular Mexican-American TV personality Poncho de Anda, telenovela heart throb Victor Gonzalez, father/daughter musicians Willy and Nicole Chirino, male model Brad Alphonso and filled the residential tower designed by Kravitz’ Design Inc. and Arquitectonica in Downtown Miami to raise more than $30,000 to support the school infrastructureat Marie’s Village Orphanage in Haiti. From Wednesday, March 6 through Sunday, March 10 the public is invited to enjoy more than 200 original works drawn from private collections and never before seen artistry at HARING MIAMI. The event is being co-produced by Michael Rosen, president and CEO of Colored Thumb, a driving force behind many of the area’s top art exhibits, and prominent local celebrity photographer Manny Hernandez. Bombay Sapphire will be hosting aVIP lounge serving an array of signature specialty cocktails, which will also be available throughout the week. The opening night celebration will also feature cocktails made with Bombay Sapphire EAST, the newest spirit from the House of Bombay in over 25 years.Complementing all will be the Haring Café by Michelle Bernstein, an exclusive pop-up restaurant where the internationally-renowned award-winning chef will indulge the senses with unique offerings created especially for HARING MIAMI. 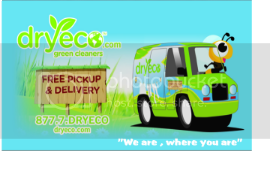 For more information contact: http://haringmiami.com/. Join Pinecrest Gardens on March 9 and 10 for The Miami Fine Chocolate & Food Show, a unique fine chocolate and culinary event that features fine artisanal chocolate creations from around the world. The event showcases the gourmet talents of local chefs and world class chocolatiers while presenting a selection of fine food products and beverages. Over 80 vendors will offer samples for you to taste and enjoy as well as specialty items for purchase. The event features: live cooking demonstrations by popular chefs, pairing seminars highlighting fine chocolate & cheeses alongside crafted beer, wine & spirits, and entertainment for the entire family. Each ticket includes 15 sample tickets for the Chocolate Rooms, Pairings Pavilion, Gourmet Grove and more.Visit: http://www.miamifinefoodshow.com/welcome.html. Aquathermes offers “Express Lunch Specials” available Monday through Friday from Noon until 2:00 p.m. including the following services: Express Blow-dry & Mani for $45; Express Blow-dry for $30; or Express Mani for $15. Aquathermes is located at 50 Biscayne Boulevard;To schedule an appointment, call 305.371.5555. The Little Lighthouse Foundation presents the Fourth Annual Hearts and Stars Gala: Monte-Carlo on Saturday, March 9 from 8:00 p.m. until 1:00 a.m. with Miami’s own international electronic music sensation Rony Seikaly as the headline performer, at Terra Veritatis, the $40 million dollar waterfront compound of Bill Dean, completely renovated by Capponi Construction. Benefiting South Florida children and families, The Little Lighthouse Foundation supports children and their families who struggle with educational, financial, and medical hardships. Celebrating four years of making a difference, The Little Lighthouse Foundation has grown exponentially from 20 to 200 benevolent, devoted volunteers assisting children and families South Florida. General Admission includes unlimited premium cocktails all night, food and access to Terra Veritatis. VIP tickets will also include access to an exclusive VIP area, access to the VIP private yacht party, exclusive premium drinks (including Johnnie Walker Blue Label and Don Julio 1942 tastings) and special food inside the Salon Privé, as well as VIP casino tables. VIP tables at the Sea Lounge Monte-Carlo are also available, which include unlimited premium bottle service all evening. Valet parking will only be available to those parties who purchase a VIP table, however, The Little Lighthouse Foundation will have pick up and drop off points where complimentary shuttles will deliver partygoers to and from Terra Veritatis. Visit the LLF Facebook page or www.thelittlelighthouse.com to keep up with all party information. Tickets for the Hearts & Stars Gala 2013 can be purchased at www.HeartsandStarsGala.com. For VIP tables or more information about the event, contact Reed Nicol at Reed@thelittlelighthouse.orgor 201.264.6356. Proceeds from the Hearts & Stars Gala 2013 benefit The Little Lighthouse Foundation, www.thelittlelighthouse.org. The Bass Museum of Art, one of Miami Beach’s key cultural landmarks, along with a select group of the city’s leading arts patrons, socialites and tastemakers will host its annual fundraiser, “A Night at the Museum,” on Thursday, March 14, from 8:00 p.m. to 11:00 p.m. The event is expected to attract more than 500 guests who will receive a private preview of Picasso to Koons: The Artist As Jeweler curated by Diane Venet. While enjoying cocktails and refreshments from Miami Club Rum, Hendrick’s Gin and Perrier with beats by Johnny the Boy, attendees will explore the institution’s new exhibition, Picasso to Koons: The Artist as Jeweler. The exhibition, featuring over 200 works by 135 artists is an intimate, often whimsical side of some of the greatest artists of recent times, each offering a singular vision of adornment. The exceptional and little-known works of wearable sculpture will reward viewers with new insights into the creative wellsprings of such artistic giants as Georges Braque, Max Ernst, Lucio Fontana, Louise Nevelson, Anthony Caro, Yoko Ono, Man Ray and Anish Kapoor. Attendees will also be given the opportunity to participate in a silent auction including art, experiences and luxury items ranging from two tickets to the Opera de Monte-Carlo in Monaco with VIP Backstage Tour to two VIP tickets to MTV’s Unplugged and jewelry made by contemporary artists exclusively for “A Night at the Museum.”Admission to the fundraising event is $250 for two and includes a Rubens Level Membership or renewal to the Bass Museum of Art for one year. To RSVP, email rsvp@bassmuseum.org or upgrade email dwolpert@bassmuseum.org or visit www.bassmuseum.org, call the fundraiser ticket hotline at 786.357.6752 or visit the museum at 2100 Collins Ave., Miami Beach, FL 33139. Ann Getty and John Hall Nelson celebrated J Nelson’s 12th Anniversary and the publication of Ann Getty Interior Style with Swarovski Elements and Timo Weiland in Getty-Fabulous style at Mr. Nelson’s namesake design showroom with an extravaganza that quickly redefined ‘white-glove’ service, on Wednesday, February 20. I knew from the moment that I opened the Peacock embossed hand letter-press invitation that we were in for a second-to-none experience of design, art, music and culinary delights. Miami International Film Festival (MIFF), celebrating its 30th anniversary March 1 – 10, 2013, is considered the preeminent film festival for showcasing Ibero-American cinema in the U.S., and a major launch pad for all international and documentary cinema. The annual Festival, produced and presented by Miami Dade College, attracts more than 70,000 audience members and more than 400 filmmakers, producers, talent and industry professionals. It is the only major festival housed within a college or university. In the last five years, the Festival has screened films from more than 60 countries, including 300 World, International, North American, U.S. and East Coast Premieres. MIFF’s special focus on Ibero-American cinema has made the Festival a natural gateway for the discovery of new talent from this diverse territory. The Festival also offers unparalleled educational opportunities to film students and the community at large. Major sponsors of the 2013 Festival include Knight Foundation, Lexus, Miami Beach VCA, Miami DDA and Miami-Dade County. 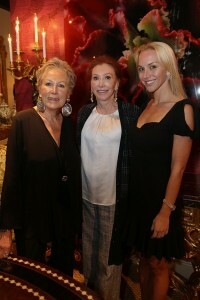 For more, visit miamifilmfestival.com or call 305.237.MIFF (3456). The Women of Tomorrow Mentor & Scholarship Program will host its 12th annual gala at the Mandarin Oriental with more than 500 of South Florida’s leading philanthropists, celebrities and politicians on Saturday, March 2. Founders, Jennifer Valoppi and Don Browne, along with Gala Chair Marisa Toccin and Co-Vice President, the Honorable Katherine Fernandez Rundle, have planned an unforgettable evening in celebration of its 17th year mentoring at-risk young girls in South Florida. The evening will begin with a lavish cocktail reception followed by a decadent four course dinner with a live performance by Soul Survivors. Honorees at the event include: Ken Gorin, Roe & Penny Stamps, ree Laurie Silvers, Nora Bulnes & Selecta Magazine, Dr. Barth Green, and Mentors of the Year Eileen Youtie and Dr. Shulamit Katzman; for more information, call 305.371.3330 or visit www.womenoftomorrow.org. On Sunday, March 3 from 4:30 to 8:00 p.m., Modern Luxury Brides South Florida and The Caribbean will host the first ever “Evening of Bridal Luxury.” The event, catering to upscale brides, is unlike any other in the market and will offer guests the only chance to see the 2013 Vera Wang Bridal Collection on the runway in South Florida. The event will begin with complimentary cocktails by Remy Cointreau and bites by the culinary experts at the Mandarin Oriental, Miami, while guests peruse a gallery of favorite wedding moments shot by the area’s top photographers. Attendees will then be escorted into the ballroom for the much-anticipated Vera Wang runway show. After the show, attendees will be invited into a KARLA Conceptual Event Experiences showcase featuring some of the most luxurious décor trends in bridal for the upcoming season. There, sounds by Scratch Weddings and a special performance by LITUS Music will provide unique entertainment, perfect for the bride who wants something different for her big day. Tickets can be purchased by visiting www.BridesSFL.Eventbrite.com; $65 for brides and $25 for guests. Bride tickets include a luxury swag bag filled with items to help every betrothed on her wedding day such as Vera Wang Lovestruck perfume, stationary, vendor discounts and more. 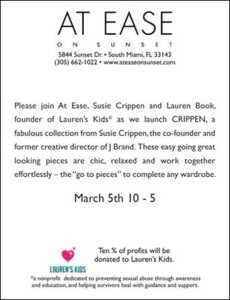 Designer, Susie Crippen of CRIPPEN and Lauren Book, founder of Lauren’s Kids will be hosting a Meet-the-Designer and trunk show at At Ease on Sunset in next week. Guests will have the chance to preview and purchase select items from the SS13 collection and meet the designer, Susie Crippen on Tuesday, March 5th. 10 percent of profits will go to Lauren’s Kids – a non-profit charity dedicated to preventing sexual abuse through awareness and education, and helping survivors heal with guidance and support. Slow Food Miami, the local 100% volunteer non-profit dedicated to “planting a fresher future for our children,” will hold its 2nd annual “Snail of Approval” Tasting Party on Friday, March 15, from 7:00 to 10:00 p.m., at The James Royal Palm. Join Chef Norman Van Aken and celebrity guest host Louis Aguirre of WSVN 7’s Deco Drive in savoring exclusive bites from Miami’s farm-to-table best, bespoke garden-to-glass cocktails courtesy of Grey Goose Vodka, specialty wines provided by Vinecraft, non-alcoholic refreshments from Whole Foods Market – South Beach, and the beautiful beachfront setting of the James Royal Palm. Main event tickets ($85) and limited VIP tickets ($165) can be purchased at www.brownpapertickets.com. Event proceeds will benefit Slow Food Miami’s Edible Garden Program. Cotton’s 24 Hour Runway Show will open to the public starting at 8:00 p.m., March 1 – 8 :00 p.m., March 2 on Ocean Drive between 8th and 9th Street and highlight 1,440 looks inspired by America’s style. Join in for an evening of music and fashion with DJ Ross One and DJ IRIE spinning beats as models walk the hottest trends down the catwalk from nighttime chic to daytime glamour. Can’t make it in person? Fashionistas everywhere will have a chance to virtually sit in the front row of this event by watching it live on http://cotton24hours.thefabricofourlives.com/runway_show. The Kids Fit Foundation is headed to Florida International University February 23 and 24 where 4-13 year olds will run a mini version of the Spartan race. The Spartan Kids race is the ultimate kid-friendly obstacle course consisting of 10 – 20 challenges. It features obstacles such as mud pits, tunnel crawls and balance beams with a one-mile race for Varsity Spartans and a half-mile race for Junior Spartans. 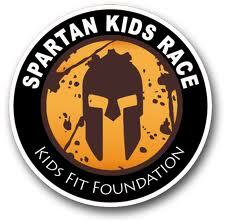 Each child will receive a T-shirt and Finisher’s Medal with 100% of the Spartan Kids race proceeds benefiting the Kids Fit Foundation. Spartan races and the Kids Fit Foundation have teamed up to encourage youth to become more active and live healthier, happier lives. Kids Fit National Spokespeople and mother and son duo Dan and Jackie Evans are best known for their participation on season five of NBC’s hit reality show, “The Biggest Loser”. The pair lost a combined total of 225 pounds.“I love being a part of the Spartan Kids races,” said Dan. “It’s so great to see these young kids having so much fun exercising. I wish I started racing at an early age because it’s all about prevention.”The Spartan Kids Race will kick off at noon. For more information or to register for the race, visit www.spartanrace.com. “Top Chef”-alum Spike Mendelsohn and Florida Cookery’s own Kris Wessel will host the first ever “Let’s Get Spiked!” celebrity chef volleyball tournament, located behind The James on the sands of Miami Beach. Mendelsohn, Wessel and 14 of their compatriots including Chuck Hughes, Alex Guarnaschelli, Andrew Zimmern, Tim Love, Pat LaFrieda, Marcel Vigneron, Adrianne Calvo, Jeff Mauro, Johnny Iuzzini, Stephanie Izard, Todd Erickson, Justin Warner and Alberto Cabrera, will be broken up into teams of four to battle in a series of fast-paced volleyball matches. It’s one of the only chances for the public to get up and close personal with their favorite chefs free of charge chefs during SBWFF. Tournament is from 12:00 to 2:00 p.m. Open to Public. Chef Art Smith of Washington, DC’s Art & Soul, in collaboration with New York’s own Big Gay Ice Cream Truck, will host the “Big Gay Ice Cream Social”, a public event to raise awareness for marriage equality in Florida. Guests will enjoy a mix of ice cream-themed stations set up in the Breezeway at The James Royal Palm, featuring treats for both adults and children utilizing local and seasonal flavors, plus boozy ice cream/sorbet floats. Location: The Breezeway at The James Royal Palm From: 1:00 p.m. to 4:00 p.m. Open to public.